Dear all. We are opening one of our rehearsals to the public. Are you interested in singing with us, but didn’t have time to join for the season, or commit to regular rehearsals? Have you sung the piece before, are able to read music, and feel like singing for a few hours? Or would you just like to come and listen, to see what one rehearsal looks like? You can join this rehearsal for free! Just register at the link below to let us know. 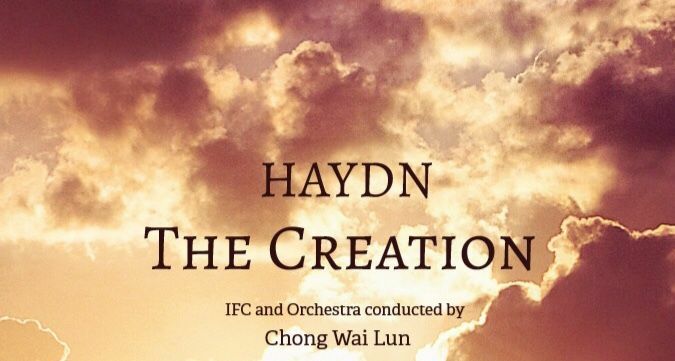 IFC is excited to be performing Haydn’s ´The Creation´ this winter season. Haydn was inspired to write this composition after hearing Handel´s big oratorios during his visits to England. It celebrates the creation of the world as described in the Bible, in the book of Genesis. People at the first performance in 1799 were overwhelmed by the depiction ("word painting") of the Chaos before the creation, the appearance of the sun, the creation of various beasts and a huge choir praising God´s work after every day. The work was published bilingually and will be performed in English with an orchestra and soloists under the baton of music director Chong Wai Lun.